Early Tuesday morning, an Afghan soldier ran amok and fired a shoulder-mounted grenade launcher into a base control room, killing two British soldiers. Afghan President Hamid Karzai immediately issued an apology statement to the British government and has publicly called for unity and cooperation between Afghan forces and international soldiers who are there to fight the Taliban. In 2008, Afghani policeman turned on American forces in at least two incidents, killing one US soldier in September and another in October, and an Afghani policeman killed five British soldiers last November. These acts from rebels who have infiltrated Afghanistan's armed and civil services demonstrate that, with President Obama's projected drawdown date of Summer 2010 and the subsequent hurried growth of security forces in recent months, the Coalition and President Karzai must devote even more time and resources to screening and training personnel to cull out Taliban sympathizers from the police and governing bodies. With the recent installment of General David Petraeus in Afghanistan, President Karzai and the coalition will hopefully have just such an opportunity to reassess and reallocate time and resources to meet the challenges imposed by continuing Taliban assaults. Hamid Karzai has been a strong supporter of the recently chastised General Stanley McChrystal and was hoping to continue working with him in spite of McChrystal's Rolling Stone interview in which he openly criticized the abilities of the Obama Administration. That's not to suggest that Mr. Karzai would not deign to work cordially with Petraeus; they have a common long-term enemy and a history of hard-fought battles against insurgents. Karzai has always had close and friendly ties to the US, and has repeatedly solicited further support from the US and its allies to oust insurgents; the US and Great Britain have the highest numbers of troops stationed in Afghanistan. At times, however, the ease of his diplomatic relations with America has been strained in light of accusations from critics and words from Karzai's own mouth. The 2009 Afghan elections were plagued by lack of security, low voter turnout, ballot stuffing, and intimidation, and Karzai was accused of - at the least - not rooting out the corruption in his ranks. His opponent in the November 2009 run-off election dropped out, and 17 of his 24 initial cabinet member picks were rejected by the Afghan parliament for having been picked due to bribes or ethnicity. In April, former UN diplomat Peter Galbraith suggested that drug use (opium, a market cultivated by the Taliban, is one of Afghanistan's highest-earning exports) is to blame for President Karzai's emotional instability and outbursts, though palace spokesmen staunchly deny the claims. "He's prone to tirades, he can be very emotional, act impulsively," Galbraith said. "In fact some of the palace insiders say that he has a certain fondness for some of Afghanistan's most profitable exports." Because of the firestorm that began after the opium accusations, the Obama Administration considered canceling the White House's invitation for Karzai to visit in May, though Obama had been in Afghanistan to visit Karzai the month before. The event opened a small floodgate of accusations from Afghani insiders, asserting that Karzai is mentally unstable. In a phone conversation with President Karzai, Secretary of State Hillary Clinton attempted to calm the disturbed waters, and Karzai apparently threatened, albeit jokingly, to rejoin with the Taliban if some of the diplomatic pressures didn't lighten up. Hamid Karzai was born in Kandahar in 1957 to an influential family of historic lineage. His father, Abdul Ahad Karzai, was a Khan, or chief, by birthright, of the kingly Popalzai tribe, a statesman in the Afghani parliament, and a strong supporter of Afghan's King Zafir Shah. He grew up in a lifestyle of privilege on the family estate amidst six brothers and one sister. He attended Simla University in India during the 1970‘s, then Himachal University of Himachal Pradesh, India and received his Post-graduate degree in political science there. He is multi-lingual and speaks several of the native languages of Afghanistan as well as Hindi, English, and French. During the Soviet occupation of Afghanistan, his father lost control of the palace and during the period that followed, many of Hamid's siblings fled to the US. They continue to work here - one as a university professor and others as entrepreneurs of an Afghani-American restaurant chain. Hamid remained in Afghanistan and later Pakistan, gathering friends and acquaintances among those who shared his anger at Soviet occupation. He and his wife Zinat, an obstetrician, married in 1998. Through the Soviet occupation, Karzai came to thoroughly despise foreign intrusion and interference. He originally supported the Taliban in the 1990's, hoping that their takeover of Afghanistan would be a bulwark against foreign invaders. In fact, he was asked to be their UN ambassador, but he broke ties with the Taliban when he suspected Pakistan's influence upon them to be too powerful. His father was shot and killed in 1999, presumably at the hands of Taliban agents. After his father's assassination, Karzai fought to drive the Taliban from Afghanistan. He became khan of the tribe in his father's place, growing his supporters from a tiny handful of men with meager supplies until he had enough assistance to first bring his father's body back to Kandahar for burial, then to physically drive the Taliban from the city. The May White House conference with Karzai and the Afghan delegation went through after all. The Obama Administration and Karzai's cabinet spent unprecedented long hours together, sharing strategies and policy in the battle against insurgents. 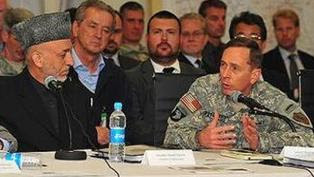 Even in May, General Petraeus was helping to develop Operation Hamkari to spread Afghan's governmental control beyond its current stronghold of the Helmand province and into Kandahar. The next parliamentary election is scheduled for September 2010, and as a condition for political funding, the international community demanded that Karzai remove both the head and the deputy head of the election committee. Karzai has done so and must find suitable, well-screened individuals to replace them. We will see whom he chooses and whether Karzai remains a faithful partner with Coalition forces, or whether he allows corruption to sabotage the future of his country.